The American Friends of the National Gallery of Australia cordially invite you to a lecture and reception with special guest speaker, Cas Bennetto, Chief Executive Officer of the Kimberley Foundation Australia. Admission for you and a guest is complimentary. We are grateful to our sponsors, Westpac Bank, for underwriting this event. The World Monuments Fund is located at the 34th Street Entrance to the Empire State Building. Guests must check in with security upon entering. The KIMBERLEY FOUNDATION AUSTRALIA was established to research, preserve and promote the rock art of the Kimberley – Australia‘s most significant indigenous cultural heritage. 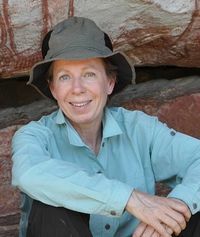 The Foundation supports integrated scientific research into the rock art and funds researchers to work in partnership with aboriginal communities to uncover Australia’s earliest untold settlement history through rock art. The Foundation is committed to sharing and using this knowledge to ensure the rock art is recognized for its national and international significance and protected accordingly.